Herman Badillo, America’s first Puerto Rican-born congressman and a fixture in New York City politics for four decades who championed civil rights, jobs, housing and education reforms, died on Wednesday in Manhattan. He was 85. His death, at NewYork-Presbyterian/Weill Cornell hospital, was caused by complications of congestive heart failure, his son, David, said. Mr. Badillo rode many horses on New York’s political merry-go-round from 1962 to 2001. Besides being elected to four terms in Congress, he was a city commissioner, the Bronx borough president, a deputy under Mayor Edward I. Koch, a counsel to Mayor Rudolph W. Giuliani, a candidate for state and city comptroller, and a trustee and then board chairman of the City University of New York. But the prize he most coveted — to be New York’s first Puerto Rican mayor — eluded him, despite six tries, in 1969, 1973, 1977, 1985, 1993 and 2001. The ’85 and ’93 bids were so short-lived, they hardly counted, and he never won a major-party endorsement, although he came close in 1973, losing to the city comptroller, Abraham D. Beame, in a Democratic primary runoff. Mr. Beame went on to be elected mayor. The peaks of Mr. Badillo’s career were his seven years in Congress, in the 1970s, when he advocated urban renewal, antipoverty programs, voting rights and bilingual education, and his leadership of the CUNY board, from 1999 to 2001, when it ended open enrollment in the senior colleges and raised standards for admission, curriculums and graduation after years of academic decline. He called himself “the first Puerto Rican everything,” and it was true in a way. He was a role model who overcame an impoverished orphaned boyhood and an inability to speak English to become a famous politician. He lost many elections but won respect as a fighter, as the first Puerto Rican city commissioner and borough president, and as the nation’s highest-ranking Puerto Rican officeholder. Mr. Badillo ran for mayor six times. He challenged Michael Bloomberg for the Republican mayoral nomination in 2001. Early on, Mr. Badillo supported bilingual education and assistance for the poor. Later, he concluded that the immigrant’s path to assimilation and prosperity lay in self-reliance, not government largess; he advocated a meritocracy of standard achievement tests, opposed bilingual education and promoted urban renewal to create jobs and housing, even when it displaced poor people. In the 1990s he became a Republican, Mr. Giuliani’s education adviser and Gov. George E. Pataki’s CUNY chairman. His last hurrah was a 2001 challenge to Michael R. Bloomberg for the Republican mayoral nomination. Even friends called it quixotic, but it reflected the trajectory of a self-made man who had often run the New York City Marathon and always thrived on adversity. Herman Badillo (pronounced bah-DEE-yoh) was born in Caguas, P.R., on Aug. 21, 1929, the only child of Francisco and Carmen Rivera Badillo. His father, an English teacher, died when Herman was 1 and his mother, when he was 5, both of tuberculosis. Relatives took him in, and at 11 he was sent to New York. Shunted among relatives, he lived in Chicago, in California and with an aunt in East Harlem. He learned English and became an excellent student at Haaren High School in Manhattan. Working as a dishwasher, bowling pinsetter and accountant, he graduated with high honors from City College in 1951 and from Brooklyn Law School as valedictorian in 1954, then settled into law practice in New York. He married the first of three wives, Norma Lit, in 1949, had one son, and was divorced in 1960. In 1961, he married Irma Deutsch Liebling; she had Alzheimer’s disease and died in 1996. Later that year he married Gail Roberts, who lived with him in Manhattan and East Hampton, N.Y. She and his son survive him. 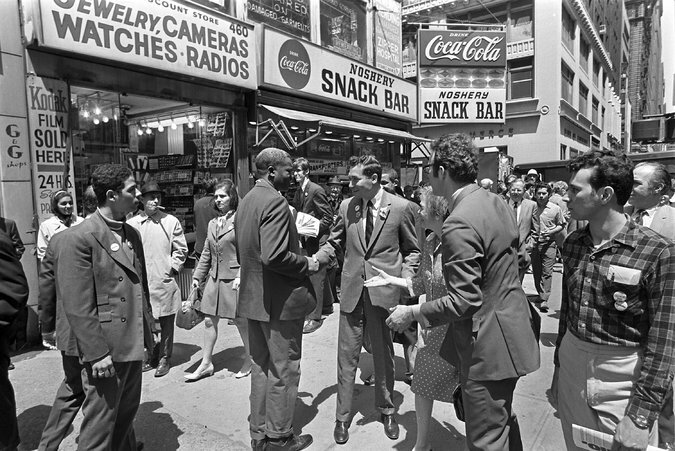 Mr. Badillo founded an East Harlem Kennedy-for-President committee in 1960 and supported Mayor Robert F. Wagner Jr.’s successful antimachine campaign for re-election the next year. The mayor rewarded him, in 1962, with the new post of commissioner of housing relocation. Mr. Badillo went on to defy Bronx Democratic bosses and win the borough presidency in 1965. He opposed the Vietnam War, backed the presidential candidacies of Robert F. Kennedy and, after Mr. Kennedy’s murder, Senator Eugene J. McCarthy, and won a seat in Congress in 1970. He was re-elected in 1972, 1974 and 1976. But while his political life would continue for 25 years, he never won another election. He quit his safe congressional seat in 1977, a year early, to become a deputy mayor to Mr. Koch. But they had a falling-out over South Bronx redevelopment, and he departed in 1979. He lost a challenge to Mr. Koch in the 1985 Democratic mayoral primary and a 1986 race as a Democrat for state comptroller. He fared no better as a Republican. He did so poorly in a 1993 mayoral primary campaign against Mr. Giuliani that he quit and became his rival’s Republican-Liberal running mate for city comptroller. He lost again, but Mr. Giuliani won and named him an education counselor. In his book “One Nation, One Standard: An Ex-Liberal on How Hispanics Can Succeed Just Like Other Immigrant Groups” (2006), Mr. Badillo said Hispanic Americans undervalued education, which he called tragic for the nation’s largest ethnic minority. He was appointed CUNY chairman in 1999, but resigned in 2001 to make his final run for mayor, challenging the billionaire Mr. Bloomberg in the Republican primary. Mr. Giuliani and Mr. Pataki, his erstwhile patrons, backed Mr. Bloomberg, the winner, and Mr. Badillo retired from politics.